Seeing I’m at the 9-month pregnancy mark, I had no choice but to keep my Mateo’s birthday party very simple this year. Skipping a party was out of the question, as he was turning 4 and very much aware that his big day was coming up. He’s also our leap year baby, so the fact that this was his first ‘official’ birthday made it all the more special. Just a quick note first, though. I seldom write about my children’s birthday parties because I find them a bit of a ‘hot topic’. Everyone has an opinion on the subject: must-have’s, do’s and don’ts, and the many expectations. If you ask me, there are no cut and dried rules on how much sugar to serve, if there will be gifts or no gifts, goodie bags, Disney themes or hired clowns. I think just as every child is unique (and every budget, for that matter), no one should tell you how to customize your child’s party. So, no judging. Zilch! In my home, I try to make the day as memorable as possible for the birthday boy, even if it means bending the whole foods/sustainable living/seasonal eating rules a bit. The parties are homemade, thoughtful, and we have a great time. What more is there? Our bare-bones guest list for Mateo’s party was 20 people – that’s a handful of friends, cousins and immediate family, the bare minimum I could get away with while still staying out of trouble. The very first way I simplified the party was to invite everyone for 1:30-3:30 for “Cake & Punch”. This is the first time I’ve omitted lunch/brunch and I rather liked it. Guests didn’t expect a meal and I had plenty of time in the morning to put my feet up and play with the birthday boy. Also noted was that my kids ate a far better lunch pre-party than they ever did at former parties. Something about not having the distraction of friends, perhaps? Anyway, as they brought me their empty soup bowls, I felt a little better about all the sugar I knew they would consume later. Homemade cake is the only non-negotiable item when it comes to my boys and their birthdays. They don’t care about decorations (perhaps this is a boy thing), don’t need organized games, (they make up their own, both indoors and out) and their only request for their big day is the cake flavor. Which, by the way, is always chocolate. Since I don’t spend much time crafting cute decorations and the like, I’ve always been able to spend time on creating a custom cake whether they are turning one or five. This year, I knew it had to be much simpler than previous cakes. 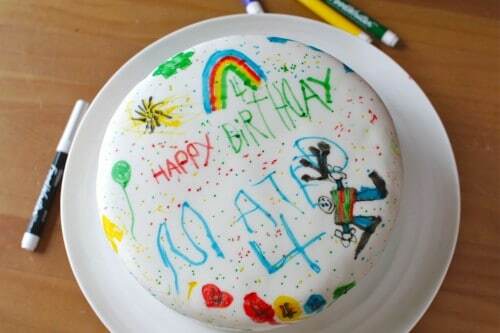 I remembered seeing Rosie’s Rainbow Doodle Cake and knew that would be a perfect amount of work. I could pull together a layer cake, and even cover it in rolled fondant icing. Then for the decorating? Why, the kids, of course. They did a fabulous job. The edible markers work beautifully on the vanilla fondant and the end result is a personal, custom designed cake that the kids feel proud of. You can get full directions and a host of layer cake recipes over on Sweetapolita. Thanks you, Rosie, for the inspiration! One 8-inch layer cake isn’t going to feed 20 people, so I exercised a key step in keeping party planning simple: delegation. I asked my sister to bring two-dozen cupcakes, and she came through with the most amazing salted caramel cupcakes. Thanks, Miranda! I also made a quick batch of Brown-Butter Rice Crispy Treats from Joy the Baker ‘s new cookbook. Incredible. With sweets covered, I added three bowls of fresh fruit, to balance things out: grapes, clementines and strawberries. Not quite seasonal, but all specially requested by Mateo. And it was his day, after all. Drinks for the children consisted of milk or lemonade (again, at Mateo’s request) from concentrate. 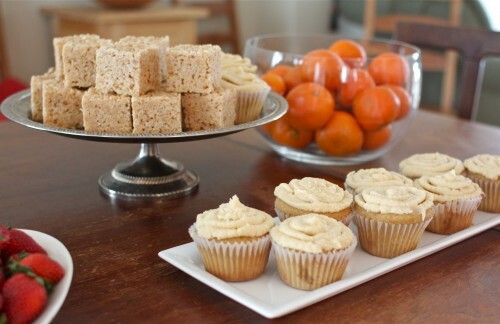 You could certainly could make it from scratch, as citrus is in season now, but again, I’m trying to stay off my feet! Grown-ups benefited from a happening coffee bar, manned by Danny and his brother, who were using our Breville Barista Express to turn out coffees for everyone, latte art and all. It was a snowy, blowy day, and it was nice to have a steaming cup of joe to wrap one’s hands around. Happy Birthday Mateo! I can’t believe my baby is four. 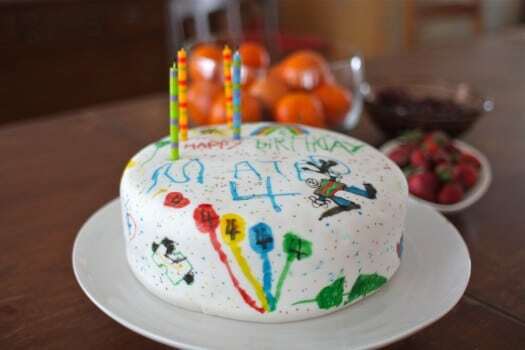 Let’s hear your tips for simplifying a child’s birthday party! 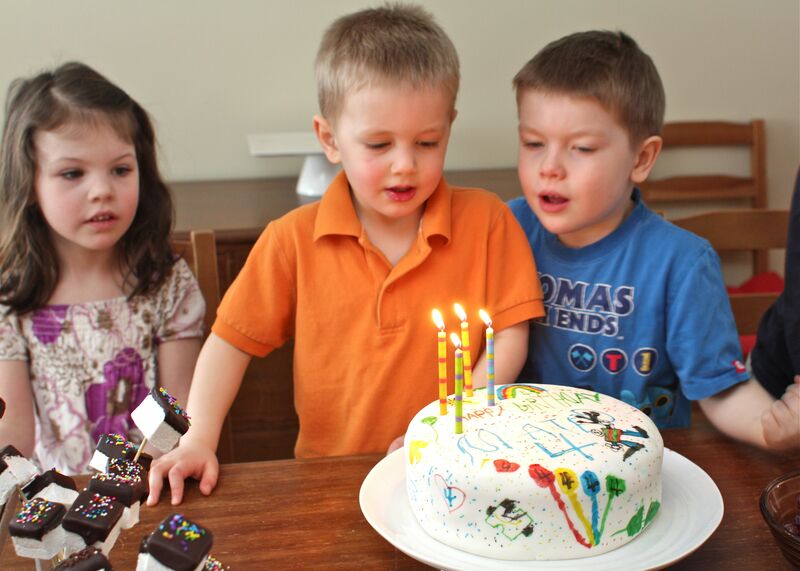 Love, love the doodle cake…one I bet they will talk about fondly in the adult years. Bookmarked.. And, remember, he will always, always be your baby boy, even if he won’t be the ‘baby’ much longer. 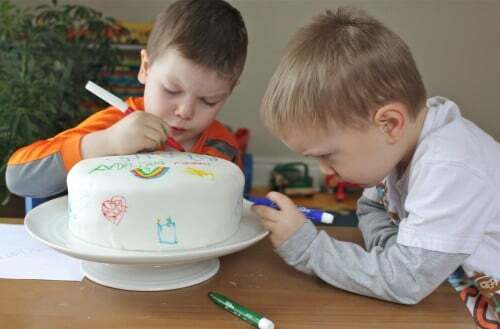 The looks of severe concentration on their faces as they decorate the cake is priceless! What a fab idea. It was SO intense, Calantha. I had a hard time editing photos for this post as I wanted to share every single one in the cake decorating series! So excited for the details of the doodle cake, I saw it on your Instagram and thought it was such a fun idea! We passed on the big party for our now 3 year old. She was happy just having family over to celebrate her big day with homemade cupcakes. these tips are amazing for my 12th birthday thank you everyone!!!!!! I have a confession….I dread birthday parties. I don’t mind family birthday parties, but I dread the “friends” party. Too much pressure! My baby turns 6 in 9 days and she wants a party with her friends. I decided to keep it simple by picking her and her 4 friends after school. They will come to our home for cake, ice cream and snacks. Then we will be heading to a “jumping” place where their parents will be picking them up. Does anyone else dread entertaining their childrens friends and parents? Entertaining is a natural passion of mine, Wendy, so I do love events like these. However, I know quite a few girls who would agree with you! Now know lots of families that have an “odd and even rule” for birthdays. Even year birthdays are friend parties and odd are for immediate family only. Helps keep the entertaining (and budget) under control. Wow………..this is such a wonderful post. I love the doodle cake. I’m going to follow your idea for any upcoming birthday parties. Love the simplicity!! What matters the most is that the birthday boy had fun. Great job and good luck in your last weeks of pregnancy. Thanks so much, Liliana! It could be any day now! I love the ownership doodling the cake gives the birthday child. My best simplifying tip is to hire a photographer. We found a young professional photographer in our area who will take photos for 2 hours and then provide a cd of digital images for $80 total. It is well worth it to us to forego goody bags, expensive cakes, Chuck E Chese, etc. to have cherished photographs of our child and extended family. Plus, we usually print the best photos and give them as gifts to the grandparents/aunts/uncles. Awesome tip, Lauren. I usually end up trying to capture the event on camera AND host the party. It’s not easy, and as you can see from the photos above, I don’t do a good job! Aimee, this is wonderful. Thank you for reminding us all that a simple birthday party is a perfectly acceptable option! I have been trying to keep our kids’ parties about fun and time spent with loved ones, and less about creating a certain paradise for the children. I want them to know that they are loved, valued, and appreciated, without throwing out the idea of living within our means. As the kids get older, their circle of friends grows, and the pressure to create a party masterpiece increases. Add Pinterest to the mix and…well, you know. So thanks for the reminder that simple can be, and is, good. Thanks for the idea about the doodle cake! I’m going to try that this year. We’ve been keeping our toddler’s birthday simple by keeping the guest list small. We also order in food rather than trying to cook for everyone. We don’t do party favors or organized games; usually we have the party at a park so that’s instant fun for the kids with no adult direction (they just make up their own games). We keep birthdays very simple. I do a party but it is more like just an excuse for a playdate. I have cake, ice cream, and drinks. I throw some balloons on the floor and some streamers fromt the ceiling and call it decorted 🙂 I don’t even organize games. I just let the kids play. they always come up with plenty to do. We will not have people bring gifts anymore now that we are embracing simple living and not keeping too many possessions. We will ask that if they want to bring a gift to bring something for our food pantry donation. We always did family birthday parties, with grandparents, aunts, uncles, cousins, and one or two close friends. Not one complaint in over twenty years, always easy, fun, and homemade. No goodie bags, no big gifts, no hassle, no stress. Food requests always seemed to be enough. Love that cake and the decorating team! *love* the doodle cake and am now ready to try my first attempt at using fondant (I’m a buttercream girl). Thanks for all the awesome links and ideas! I so appreciate your common sense tone. It’s steadying. I love the simplicity of it. My kids are grown, but to hear my daughter talk about the intricacies of the parties her kids are invited to, whew! Said daughter has 6 children, with all birthdays from May-Sept, so she tries to keep it simple and group the logical ones together. I love the cake idea and her kids love the kitchen so I am definitely going to share this post! Fantastic tips. I have only hosted a handful of birthday parties for the kids. Generally we let the birthday girl or boy pick a meal out and something fun to do with the family, and every other third year they can choose to have a party or not. Lene has this far (5 years in) never had a party, but we have visited a number of water parks and gone out for sushi at her request. Last year Kiera chose to invite 3 friends to a movie, and she told them no gifts (strange girl). Still, I love the idea of the traditional party, and keeping it sweet and simple was such a good idea for you. I look forward to meeting that bundle of joy soon. I always have two separate parties for each school-aged child – a simple family party (which I personally enjoy the most) and a “friend” party which is usually someplace other than my house. Recently, my eldest daughter had a family party at home (pizza and homemade cake) and a “friend” party at an ice skating rink with cupcakes and hot chocolate. I have found that mixing friends and family at a birthday party is too difficult; half of the kids doesn’t know the other half. This is the best way I have found to avoid that situation. Decorating the party room (usually either the kitchen or the dining room) is my favorite thing to do. I always do this the night before (and usually stay up way too late). But you should see how excited their little faces are when they come downstairs in the morning! It is difficult when they are little (especially ages 4-6) because they usually want a commercially-themed party. But when they are younger or older, you can really surprise them! Last year, when my eldest child turned 9, I had him convinced that he was too old for party decorations. When he came downstairs the next morning, he discovered that the whole kitchen was filled with Phillies baseball memorabilia, steamers in red, white and blue, and huge posters on the walls of his favorite players (which he then got to hang in his room after the party). So much fun! That is the most sane birthday party post I have read since I started reading blogs. Congrats to you for doing what was right and would work for you and your family. I really love the cake and will keep that in mind for the future. I really appreciate that, Jennifer, thanks for commenting. I too loved the decorated cake. That’s a really great idea. I have a question on the salted caramel cupcakes…is there recipe posted somewhere or can it be shared? My daughter is turning 7 in a couple of weeks and she LOVES salted caramel! I’m going to ask my sister where she got the recipe, because they were fabulous!! There is a great salted caramel cake recipe (could be modified for cupcakes) in the book “Cake Simple” by Christie Matheson. It also includes a good recipe for salted caramel frosting. Wishing a Very Happy Birthday to Mateo! I love that they can doodle right on the cake, so fun! I love simplified birthdays! Out of necessity, we don’t do big parties (5 kids who have birthdays in a 2 1/2 month time frame precludes that!) but we do have traditions that everyone eagerly anticipates. The birthday boy gets to pick the meal (within reason, I did have to veto that one request for lobster, prime rib, shrimp and fried chicken), the dessert (including the one year I did a photo-realistic 3-D globe by request), the entertainment (movie, games, hiking, etc…), and gets a couple presents. Our kids begin planning their birthday meals months in advance. It’s not fancy, but neither are we. We’re just happy to be hanging out together and having a good time! I love the cake. I’m sure the boys got a big kick out of decorating it their selves and loved all the attention that they got from it. I also did a cake and punch birthday for my daughter this year. She turned 3 and I just didn’t have it in me to go all out and we don’t give her any sugar after 4 as a rule so I liked having it at 1:00. I think I’m going to keep doing it like this. We just had a friend and family birthday parties for my boys! The recent one was pretty simple and so fun for 14 and 12 year old boys! We did a nerf gun war in our basement. I made taco bowls with tortilla chips, grated cheese, chili and some other snacks like ice cream, cherry sauce, and chocolate syrup with some candy to go on top, Kettle corn, vegetables and dip and some salsa…. It went fast and went really well! We had 14 boys! 14 boys…whoa. Now that might freak me a little, but I’m sure I’ll have time to prepare for that…My oldest is just 6. Good for you! Sounds like a smashing event. These are great ideas. I am 34 wks. preg. and my son will turn 6 soon after the baby is born. I think I’ll steal your cake and punch idea! Oh yay! Congrats on the pregnancy, Amy! I have to say, this is the most wonderful idea. I loved Rosie’s post and I am so glad that you did one as well. Happy birthday to the little one! Thank you so much, Brian!! LOVE how beautifully simple your party was. I just celebrated my daughter’s 4th birthday as well and while she wanted a Toy Story-theme, we restricted it to just the cake and the party favors. Decorations were simple green and blue balloons. Also, yes, we too, kept the guest list to a minimum of favorite friends and close family. Love the decorate your own cake idea!! Hooray for simplicity! We have two daughters, who are just a year apart. We have decided to only do “friend” parties once every 5 years, and the other years keep the guest list to just our household. On the year of the big party, we go all out with a theme chosen by the birthday kid. The other years, the birthday girl gets to choose the meals and activities for the day. Then my other daughter and I plan, do the shopping, make a cake, and hang the birthday banner together. It’s been a great way for my girls to learn to do things for others, and think about how to make each other feel special. Every person in our family gets birthday breakfast in bed. Every year. It’s our favorite tradition. I LOVE birthdays at our house! This is brilliant. With these tips one can easily organize a brilliant party with simply spending not too much money and hence keeping his budget in control. Great article! Birthday parties at my home always make a lot of mess and stress and when it is finally over and I can relax, it is nice to look back and see how nice it was and most important – my children are happy. I found an idea about cake decorating amazing. Will definitely try some of your tips for my children next birthday party. I typically make an elaborate cake/cupcakes for my kids’ birthdays. It is a tradition we all love (except when they grow out of it as my 15 year old has – now he wants a simply decorated ice cream cake – which I make). Anyway, this year my schedule is incredibly tight the week before my youngest’s 9th bday party and I wasn’t sure how I was going to pull off the usual cake decorating process. I’m so grateful I’ve found your post – I showed my 8 (soon-to-be-9) year old son the doodle cake and he LOVES the idea! So, he gets a cake that he LOVES and I don’t have to put in the time to decorate. THANK YOU for sharing! High fives all around! Have a happy party. I agree with that birthdays can be inexpensive and less complicated with the right plan. Everything should be in place and also it is a great idea to have some homemade menus. I love your ideas for a good birthday party. Your idea of not providing a meal, and just providing cake and punch is a great one. That would definitely save us a ton of time on the party planning. This has helped me tremendously and I appreciate your insight. Our toddler turns two in a week and we werent going to do a party due to all the stress and work involved. We will be having a gathering of friends at the neighborhood park for cake, ice cream and snacks. It’s sounds fun preparing the cake with kids. They can customized it the way they want. It’s also a great way to bond with them.